"Broken Hill" or"Broken Emotions" which ??? The photograph above was used by science writer, Chris Clark, of Yucca Valley/Joshua Tree high desert fame, who was providing a list of some wonderful Nature Preserves & Reserves to visit in and around San Diego County. It was written back in 2015 and I believe the photo by Scott Davenport was either 2013 or 2014. Wow what a contrast when you look at the other photograph below. 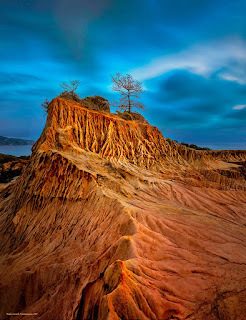 Scott Davenport has also taken numerous photos of this same location since which reveal the now dead Torrey Pines. Other people have also, it's a most popular tourist spot. It should be noted that the above photo is usually the only photo which generally is used toadvertise and promote Torrey Pines. 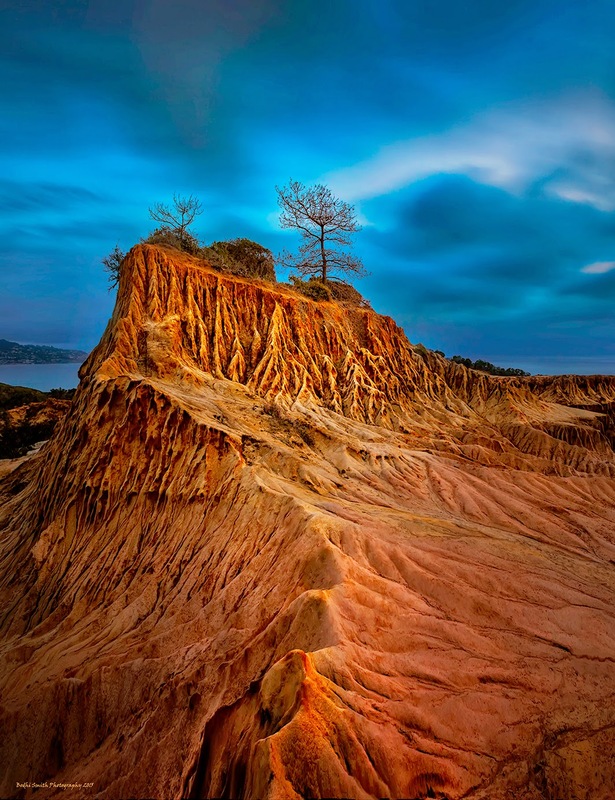 What you won't see is today's reality on the ground in a photograph, even from the Torrey Pines State Reserve. Of course it's understandable as to why. For example photographer Phillip Colla took this photos here below. To be honest, from this angle things look totally dead, but I believe on the other side of the geological formation you can see from a different angle that there is still one live Torrey Pine. What struck me most by the three photographers I'm referencing here, but also all other photographers I've Googled on the net , none of them ever make mention of the dead trees or the changes that have taken place. Their conversation is always about the light, the clouds, the sunset or the sunrise, the geological patterns in the bluffs etc. But nobody says anything about the very trees for which this reserve is named after, Torrey Pines State Natural Reserve. "I have been trying to catch a special image of this spot for close to one year now, having shown up to this place numerous times only to go away empty handed. But alas, finally last evening I was able to capture something worthy of my own liking." "I have just been patiently waiting for the right conditions (clouds, sunset, springtime)...so when I got to Broken Hill, I did not need to figure out where I was going to set up for my shot..."
Other Locations with Bad News -> North Loop - "The Guy Flemming Trail"
Who hasn't visited Torrey Pines State Natural Preserve and stepped off of the old narrow asphalt road where the sign says in bold letters, "North Loop," then right under that, "The Guy Fleming Trail." I've done this many times since the 1960s. 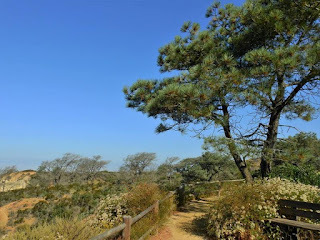 This was one of the better and easiest trails to hike and actually get inside of the Torrey Pine forest. Most other trails are broken up with chaparral, but this is forest. 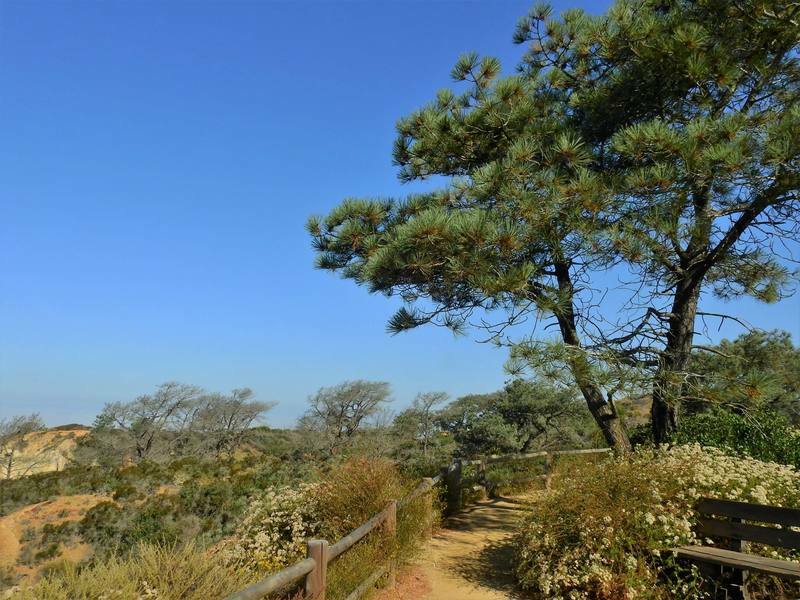 Other areas of dense Torrey Pine forest you can only see from a viewpoint distance to protect them. It's also not especially steep or challenging and it takes you right next to the viewpoint of Torrey Pines State Beach overlook. Interestingly the woods at the end of the trail are like the stunted growth of common chaparral we call, "Elfin Forest," because they are windswept by the ocean breezes which have sculpted them this way. Often the signage will comment on the grotesque and/or picturesque shapes and explain the natural phenomena of the windy salty air that created these shapes. But something's changed here as well. As you continue to on ahead walking down a little further in the photo above, you can see in the distance that something has gone terribly wrong here too. Courtesy of Jeremy Spath, of Spath Gardens, for landscape design and installation in Southern Ca. Almost three years after the green forest photos above were taken, the bark beetles have taken their toll here as well. 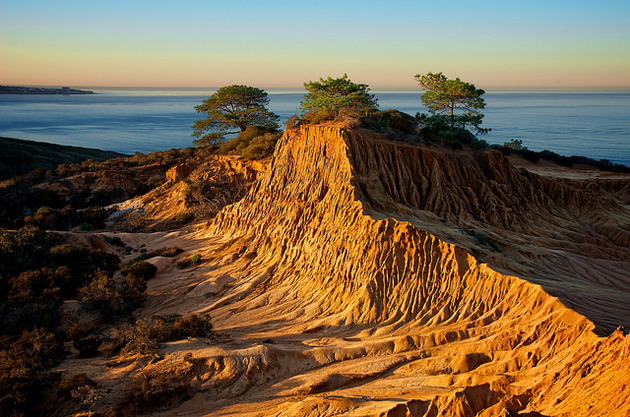 In actual fact almost everything in the way of older Torrey Pines are dead. This photo at right is provided by the Torrey Pines Association which was founded in 1950 with Guy Fleming as it's first President. 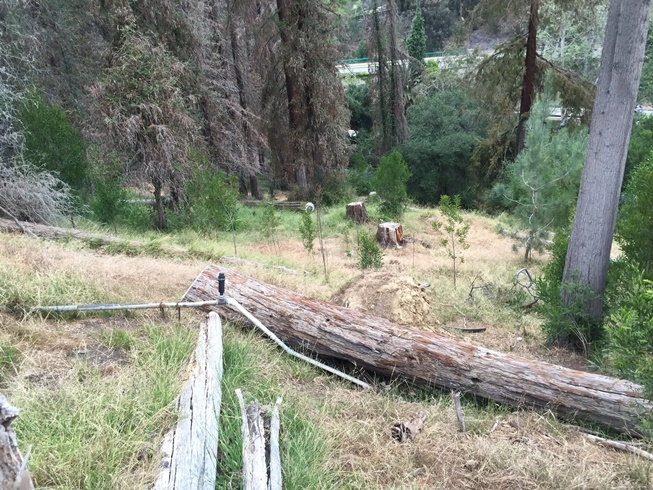 The article which accompanied this picture on the right explained why this trail has been closed for a year. Clearly things had to be upgraded from wooden post railings to steel and newer younger trees had to be planted to replace the dead ones. Apparently funds were made available by the Scripts Foundation to complete trail repairs and rehab some of the main attraction ecological features. It will be decades before people we begin to see a glimpse of the beauty that one existed there before. Below here is an except from the article with link by Peter Jensen. "Poor High Point! A good number of trees have died here in recent years, victims of the drought, and the old railing made of peeler poles was usually in a state of falling-down disrepair. But this trail is finally on the “come back." The obvious popular answer of course is climate change and the last five years of drought. Add to that higher than normal temperatures and less rainfall and those are ideal conditions for pine bark beetles to do their dirty work. 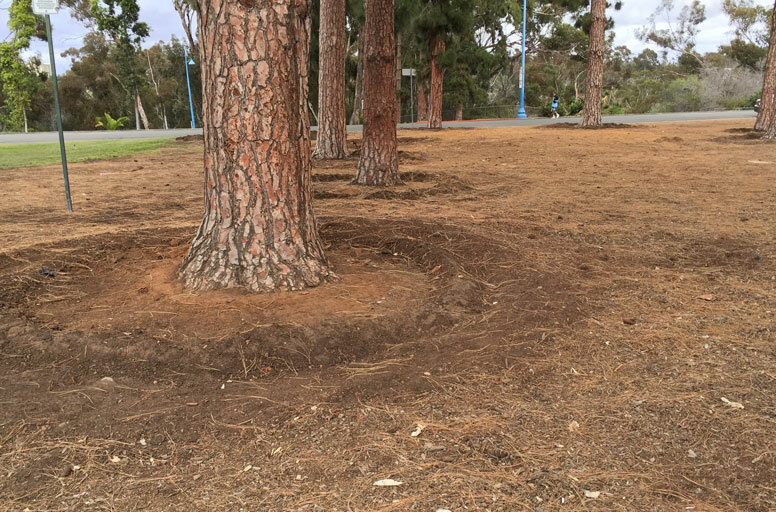 If conditions are normal as far as the soil's mositure content sense, then Torrey Pines should be able to manufacture enough sap or pitch to ooze into those bore holes drilled by a pine bark beetle who wants to lay eggs and hatch young. The sap or pitch would drown out any of the beetle larva. So in normal average rainfall years, San Diego and Del Mar average around 10 or 11 inches of annual rainfall, but of course for the past five years they have only received half that amount or less and have had to endure much higher than average Temperatures. So that sounds reasonable as to a cause, but something's just not jiving next door at the Torrey Pines Country Club and Golf Course. 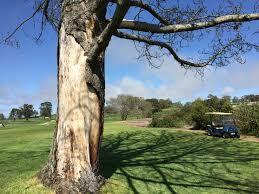 One of the puzzling anomalies regarding the death of torrey Pine trees are the loss of trees at the world class Torrey Pines Golf Course. Now as understandable as it is to see Torrey Pine trees dying at the State Reserve which is the neighbour to the north because of drought, it's tough to phathom what's really going on next door at the golf course. Even "IF" there is climate change, drought, less than average rainfall, none of those things should matter at the golf course which is loaded with massive amounts of water availability. After all, Golf Courses use more water than anywhere else, especially in the drier climates of the southwest or you don't get green grass. Plus there are the other factors of normally hotter months like May & June being cloud covered here with what they term "May Gray" or "June Gloom." Temps at their hottest here are generally in the 70s Fahrenheit or 20s Celsius. And yet take a close look at this photo of a dead tree in the middle of green wet grass taken by Jacob Sandoval. I'm always telling people who want to plant natives which prefer things a little on the dry side, don't plant next to or in lawns because this is comparable to things like a lakes or bogs when it comes to constant available water. Watch this video below. This video below was done by San Diego resident, Dale Williams, who argues that aluminum, in combination with acid fog, weakens Torrey Pine trees and was the primary cause of their die-off in 2014-16. Frankly, I'm not altogether sure, but here is his take on the subject. 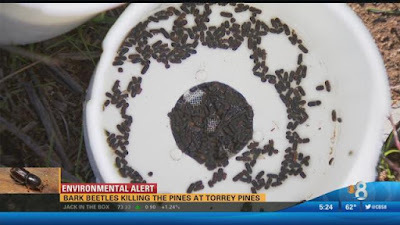 This photo above the video are the bark beetle pheromone traps used to attract and capture these little pests that are killing the trees. The link below the photo is from News 8 (CBS) in San Diego which aired back in January 2016. The second video is from ABC 10 News just a couple of months later. Take note however that in both videos, we're not talking drier areas like Torrey Pines State Reserve, but rather trees inside green lawns in both the gold course and city of Del Mar. The news reporters said that the traps should help save the trees until winter rains come, but that's nonsense since these trees have incredible access to water already, plus Torreys have always been subject in Nature to drier habitat locations. Former Nature Film producer, Jim Karnik (no deceased as of earlt last year 2017), also provided a good video on this very subject. It's a pity that many environmental groups paid little attention to Jim's passing away. In fact this video below which appears to be his last, only received 55 views EVER. I guess non-profits are more interested in donations and membership drives. For a very long time now I have wondered if maybe the underground microbiology could itself be in decline in many areas as well. Most humans only have in their minds things that we can see. 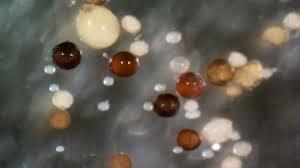 The underground microbiome is completely out of sight and therefore out of mind. Think of the forest as a sort of an amusement park like Disneyland. The tourists only see the beaty colour and glitter of the theme part, but they never see the behind the scenes sophistication of the machinery, computer systems, staff, security, etc, etc, etc that make it all work and function smoothly. Many nature lovers assume that nothing could possibly harm that tough microbiological community. That's why when I've suggested people inoculate plants at time of planting, even in the wild, the typical sarcastic response I have gotten has been, "You don't need to inoculate because fungal spores are just everywhere out there in the air." Not a very scientific take, but more of a blind faith affirmation. Human beings have so radically changed nature's surroundings, that past normal behaviours of the natural world are not responding and functioning as they once did. 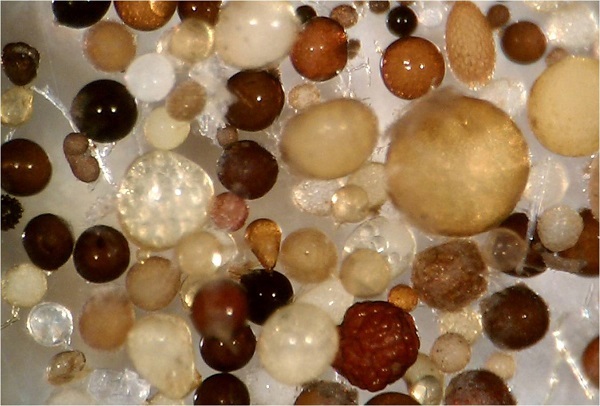 Yes, mycorrhizal fungal spores are no doubt well populated within many healthy wild soils like the large population of fungal spores taken from a soil sample in the photo above-right by Soil Scientist & Mycorrhizal Fungi Specialist, Dr Wendy Taheri. Prior to the missing mushrooms or puffballs, the Coulter and Jeffrey Pines just above Anza Valley within the Table Mountain area had been in major decline. Trees everywhere were dying, but I had first noticed that the puffballs or truffles were now missing when previously there were always 100s of them after a summer monsoon Thundersstorm or even in their Springtime crop appearance. Everything to do with mycorrhizal fungi shut down and then next the trees went. Oddly enough I found other valuable collecting locations in the forests and chaparral biomes south of the gold mining town of Julian in San Diego county. The picture above is the truffles I found south of Julian. 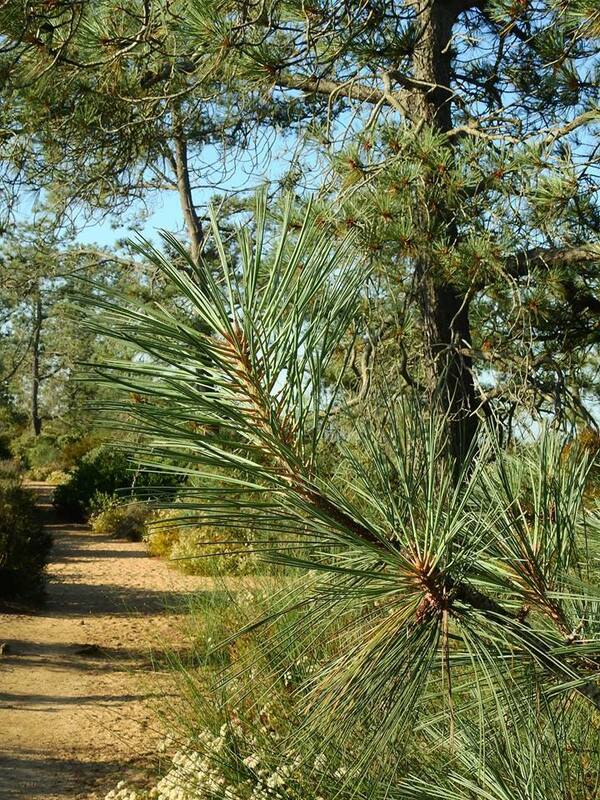 In the year 2014, I remote planted a Foothill or Digger Pine (Pinus sabiniana) on some of his wild acreage far away from any irrigation sources in Ranchita, California in eastern San Diego county above Borrego Springs. I planted this foot tall one gallon container tree you see here in the photo in between the native chaparral (next to a scrub Oak). My brother watered them that first summer (we planted in summer with temps at 104 F) clear thru to winter, he didn't need to water thereafter. The tree as you can see here is now about three to four foot tall as of 2016. He recently told me it's much bigger now. My point here is that the microbiome is important and it may be in decline like everything else we see. I've successfully remote planted Torrey Pines in a low elevation mountain range around El Cajon, Santee and Lakeside. Most locals know it as Rattlesnake Mountain. Here is a link to my successful experience in this hotter than coastal conditions with Torrey Pines which proved far healthier than those along the coast and in drought conditions. 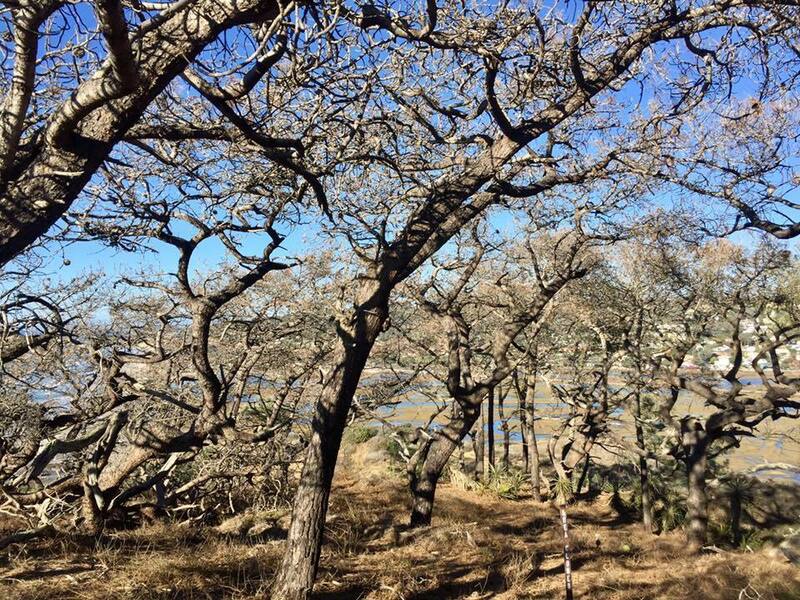 But even these important components may be in decline at Torrey Pines State Reserve and explain far more than just hotter temps and lack of rainfall. These trees have been here for 1000s of years and I've certainly not seen the serious problems there in my lifetime like we have now.